Darren moved from his hometown of Ashington in the NE of England to Boca Raton, FL to attend Lynn University in 1995. Upon completing 4 years at Lynn with a BS in Sports and Recreation Management, he was drafted by 3 professional organizations to continue his playing career. He finally decided to hang up his boots and transitioned into coaching full time becoming a Director of Coaching at the Virginia Rush in Virginia Beach. 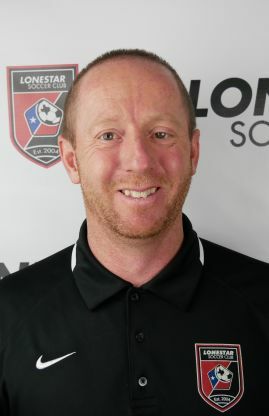 In 2013, he joined Lonestar SC and is currently the Boys' ECNL Director. Darren has been happily married to his wife Erin for 20 years, with their 3 kids, ages 18, 15 and 12.